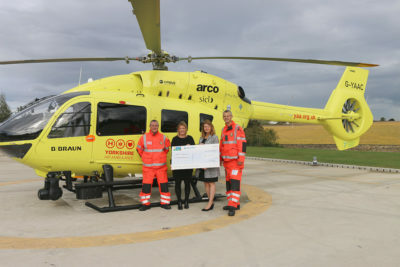 Our ongoing support for Yorkshire Air Ambulance has soared well above target and has seen us hand over a £6,000 cheque to the “angels in the sky” – three months earlier than expected. Caravan Guard and Leisuredays donate £2 to the charity for every new Gadget and Leisure and Home Emergency policy sold to our customers. We set a target to raise £5,000 by the end of the year, but other fundraising activities has meant the charity has received the money sooner. 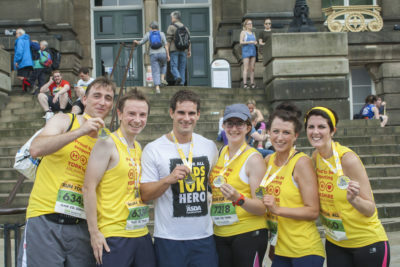 We had a team of 10 runners who took part in the Leeds 10K this summer and staff dressed up in yellow for Yellow Yorkshire Day – seeing our fundraising fly even further. An ambitious new target to raise a further £5,000 has been set for August next year. Caravan Guard Director Louise Menzies said our team had really got behind the Yorkshire-based charity after hearing first-hand about their life-saving work. And our Head of Accounts Graham Dobson, has been on the receiving end of care from the emergency responders after a bike accident near Hebden Bridge in 2010. 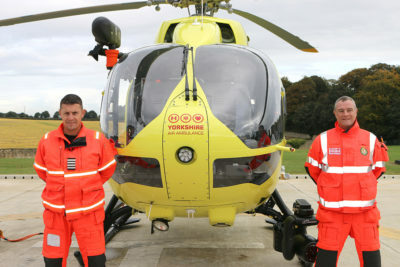 Kerry Garner, regional fundraising manager for Yorkshire Air Ambulance, said: “We’re absolutely delighted with the continued support we have received from Caravan Guard, it is support like this which enables us to save lives across Yorkshire. Caravan Guard and Leisuredays support a number of local and national charities and hope to continue to encourage more of their customers to take out their Home Emergency and Gadget and Leisure policies so even more money can be raised for Yorkshire Air Ambulance by August 2017.